I thought up something real good yesterday but I didn’t write it down. If I was twenty years younger……. this would have been a one day job. Yesterday I did the hallway which wasn’t too bad as there is no clutter to work around. I worked down the line taking tarps and newspapers with me. 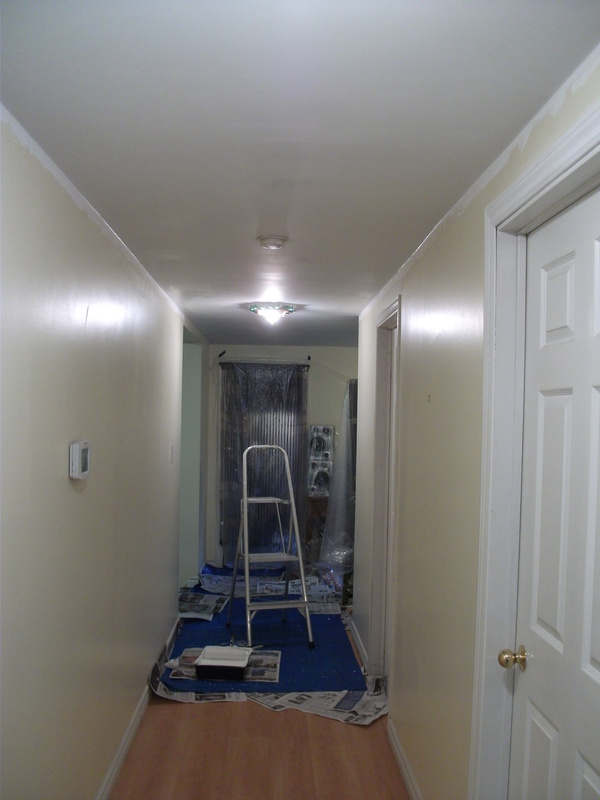 At the end of the hallway there is a 7 X 8 foot nook…. just a little more ceiling to go but I had to leave it for today. In this nook is my sewing machine and computer and the worst clutter of all. I told myself I was going to clean it up and file it all winter but I didn’t. It’s a mess I can hide with my fancy room divider. It’s been cloudy and rainy for all these days so I can’t fully enjoy my handy-work yet. I had to bring out floor lamps and any extra lighting I could get yesterday. I sure hope the sunshine doesn’t reveal any missed spots! I’m going to cover everything in plastic sheets and finish this ceiling today!